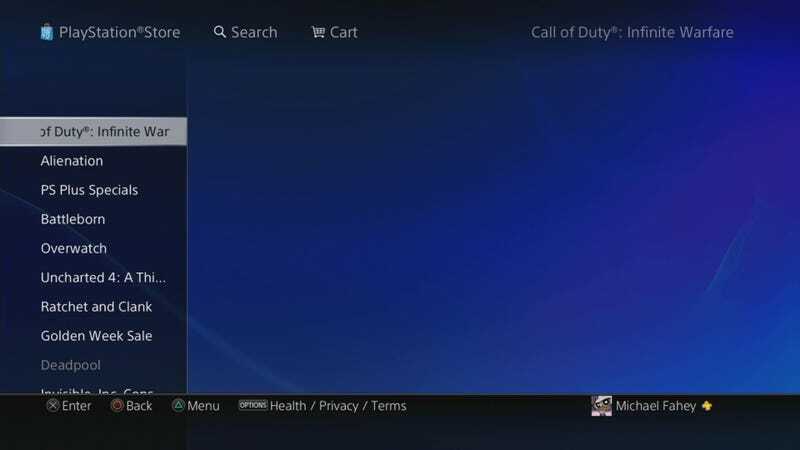 Discovered via Reddit and confirmed via in-house PlayStation 4s, the trending section of the PlayStation Store features a listing for Call of Duty: Infinite Warfare. There’s no text in the listing beside the name, but it certainly fits the conventions. It’s got warfare in it, and it is Infinity Ward’s turn in Activision’s three-year, three-developer Call of Duty cycle, so Infinite Warfare certainly sounds like a plausible name. It certainly fits with rumors that the next installment of the franchise takes place in the far future. Now all we need is confirmation or denial from Activision and we can move on with our lives. Update 4/26/16 2:30 PM: The listing is now gone from PSN, as if it were not supposed to be there in the first place.